With Rabbi Schwartz out of town, I served as lay leader this past Friday for our Shabbat services, and I'd like to share my D'var Torah here on our congregational blog. This week's Torah portion is the third in the yearly cycle of readings. Two weeks ago, the parsha told the story of Creation, which teaches us that all the world is subject to one rule, one set of laws, natural, spiritual, and ethical, that there is an underlying unity and coherence to the universe. And it teaches us us that all of humanity is one large, extended family, all descended from the same ancestors, all children of Adam and Eve. The idea that we are all blood relations is reinforced in last week's Torah portion, which tells the story of the flood, and says that we are all descendents of Noah and his wife. Ten generations later, Abraham is born, marries Sarah, and migrates along with his father Terah, and his orphaned nephew Lot, from the city of Ur in Mesopotamia towards the land of Canaan. This is where last week's parsha ends. This week's Torah portion is called Lech Lecha, which means Go Forth, and it begins with God giving Abraham his marching orders. Ten generations have gone by since anyone has heard God's voice. The Torah makes it clear that divine revelation is not a common occurrence, that after establishing his covenant with Noah, God remained silent for approximately four centuries. I believe in the sun even if it isn’t shining. What the Torah teaches us is that Abraham was the exception, not the rule. So we shouldn't expect God to summon us, instruct and command us, in a booming voice from the heavens, or through a telephone call, or by way of engraved invitation. We have to do the work ourselves, seek God out through study and introspection, to search within ourselves, to find the quiet time when we can listen to that still, small voice, to hear the echoes of the divine within ourselves, and in the world all around us. So who were the souls they had acquired? Slaves, servants, handmaids, and the like, as was the practice back in ancient times. And while this may not harmonize with our contemporary democratic, egalitarian sentiments, I think it is important to understand that when God tells Abraham, I will make of you a great nation, the beginnings of that nation, the House of Abraham, is a household, an ancient concept that includes not just the blood relations such as Lot, and the relations by marriage such as Sarah, but also everyone else who is associated with this family, this clan, who is, in the language of the IRS, a dependent on the head of the household. We can see here, in the very beginnings of the story of the Jewish people, a pluralistic notion of what we mean by referring to ourselves as a people. Abraham and his household settled in Canaan, but after a time they were forced to be on the move again, as the parsha relates: "And there was a famine in the land, and Abram descended to Egypt to sojourn there because the famine was severe in the land" (12:10). So Abraham's journey extends from Mesopotamia in the north to Egypt in the south, before returning to Canaan for good. And in this way, the story of Abraham bridges the areas where the earliest civilizations appeared, first Mesopotamia, and then Egypt. What we have come to know as western civilization or western culture begins with the first settlements in these two regions, along the Tigris and Euphrates Rivers in the north, and the Nile in the south. There, the first cities appeared, and the first writing systems were invented. The story of Abraham then represents the meeting and binding together of the world's two earliest civilizations, resulting in a kind of hybrid energy a synthesis and synergy out of which the west was born. The Torah portion goes on to relate that Abraham feared that the Egyptians would kill him and take his wife for themselves, so he told them that Sarah was his sister, and she was taken by the Princes of Egypt and given to Pharaoh. At this point, God intervenes, and the Torah relates: "And the Lord plagued Pharaoh [with] great plagues as well as his household, on account of Sarai, Abram's wife" (12:17). In this way, the story of Abraham foreshadows the story of the exodus (to consider it in literary terms), and provides Abraham with his own version of the very experience that defines the Jewish people generations later. But more importantly, this portion of the Torah teaches in the form of a story what is later expressed as laws and commandments, that you shall not covet or commit adultery or murder. As an abstract rule, you can say, thou shalt not… But in a narrative, you can't express a negative concept, except by showing the rule being violated, and the guilty party punished. Abraham is not guilty, because his fears are well-founded. Killing a man and taking his wife was far from unknown in ancient times. In fact, King David was guilty of this sin, although in that case the murder was indirect, sending Bathsheba's husband to the front lines, where he was killed. And David was punished severely for it. The lesson is reinforced over and over again in the Bible, that it is a sin for those in positions of power to abuse that power, for the strong to take advantage of the weak. And while God is the ultimate source of justice in these stories, they also teach us that we share in this obligation to protect those in need, to fight for social justice. Here we find here the idea of making peace by dividing up the land, an idea that has some resonance with contemporary concerns in the Middle East. But this also reflects a different way of life from that of Pharoah's Egypt, or the Mesopotamian city of Ur. It is a tribal, nomadic form of life, as opposed to city life where people crowd together in the same place, and the number of people living together can increase dramatically as more and more are packed together into the same space. In the older, tribal way of life, if the population increases past a certain point, groups split up, and go their separate ways. What we find here, and throughout the Torah, is a depiction of Abraham and his descendents as rejecting the cities and the way of life that they represent. Abraham leaves Ur, and has trouble in the city where Pharaoh dwells. In next week's parsha, the cities of Sodom and Gommorah are destroyed for their evil, and in Exodus the Israelites are enslaved to build cities for the Pharaoh, while God is encountered in the wilderness, at Mount Sinai. In the Book of Joshua, the Israelites take on the city of Jericho. It is not until David conquers Jerusalem, and Solomon builds the Temple there, that we see the negative view of city life start to change, and even then, the prophets come from outside of Jerusalem, from out of the wilderness, while the city of Babylon is associated with the tragedy of the first destruction of the Temple. This parsha also includes the story of how Sarah couldn't bear children, and gave Abraham her Egyptian handmaid, Hagar, who gave birth to Ishmael, who is considered the ancestor of the Arabs. Sarah then gets jealous, and drives away Hagar and her son, but they are protected and returned by God. Again, we have a lesson in justice, and learning to live together in peace. Circumcision is the mark of identity, a tribal rite of initiation denoting membership in the tribe; of course there has also been ample evidence that it confers a variety of health benefits as well. But here it is established as the sign of God's covenant, it is literally God's mark that is inscribed upon the human body. All other forms of alteration to our bodies, such as piercing and tattoos, have traditionally been taboo in Judaism, the idea being that the human form is made in the image of God and must not be altered, but this is the one exception, an exception for the very reason that it is ordained by God. The initiation and change in status is reflected in the renaming of Abraham and Sarah, which can be connected to the difference in dialect and language between Mesopotamia and Canaan. But we can also find a modern parallel in Ellis Island, and the renaming that took place for many immigrants coming to America. After all, Abraham and Sarah were also immigrants, and that kind of move represents a change of identity as well as residence. Name changes are also traditionally associated with marriage, and with the adoption of children, and the covenant with God constitutes a kind of marriage and adoption. But it is also the case in many cultures that a new name is given following an initiation ceremony, and in this story Abraham together with Sarah have been initiated into a new stage of life, in their covenant with God. But what of God's promise that Abraham will be the father of a multitude of nations? And earlier, God had said to Abraham: "Please look heavenward and count the stars, if you are able to count them." And He said to him, "So will be your seed." (15:5). Today, estimates place the population of the Jewish people between 13 and 15 million, which may fit in with this description, but represents such a tiny percentage of the population of the world. Even when you add the descendants of Ishmael, the Arabic peoples, whose numbers are estimated in the vicinity of 450 million, we still are left with a small portion of the over 7 billion people in the world today. But when we count Abraham as a father not by blood, but by ideas and inspiration, of all of the monotheistic religions, then the prophecy especially seems to come true. Today we use the adjective Abrahamic to refer as a group to Jews, Christians, and Moslems, all of whom claim Abraham as our spiritual father. The Torah relates that we, as Jews, are the inheritors of his covenant and his household through Isaac and Jacob, and it is a legacy that we are proud to share with over four billion others, over half the population of the planet, all of whom are a part of our extended family in that line of descent symbolized by Noah and his wife, and Adam and Eve. Tis the season of debate for everyone, from the candidates for president to those running for local office. So much of the debate is negative and substandard that we are tempted to dismiss its value—but that would be a big mistake for us, both as Jews and as Americans. Ever since Abraham’s famous argument with God, Judaism has been full of debates. In my new book, Judaism's Great Debates, I present 10 such arguments—between Moses and Korach, David and Nathan, Hillel and Shammai, the Vilna Ga’on and the Ba’al Shem Tov, Spinoza and the Amsterdam rabbis…. The list goes on. But in truth every one of the debates, while situated in history, is timeless. Every one of them has ongoing relevance. Abraham, for example, was arguing about the haunting question of collective punishment, about proportionality when confronting evil. That question is everywhere. I would go so far as to say that debate and disputation not only are encouraged within Judaism, they are at the heart of Jewish history and theology. The great debates are still being argued! Have you ever thought about Judaism not so much as a series of resolved doctrines but as a tapestry of unresolved arguments? Our sages understood that a debate for the right reasons enhances Judaism. A debate for the wrong reasons detracts from Judaism. Deep respect is given to both schools because both sides are speaking the truth as they see it, and both have the welfare of the community in mind. Some people will tell you that we need less debate; that for the sake of unity we need to stifle dissent and limit the amount we argue. I say that we need more debate, not less, and that we will emerge the stronger for it. But what we need is the right kind of debate. Some people will tell you that we need less denominational division in the Jewish community, again for the sake of Jewish unity. In fact, that was some people’s reaction at a major forum on the subject in Philadelphia last spring, when leaders of the Reform, Conservative, Orthodox, and Reconstructionist movements met in dialogue. I say we need more diversity, not less, and that we will emerge the stronger for it. But we need the right kind of diversity, the kind that respects pluralism and affirms that while the differences are real and important, what unites us is greater than what divides us. “Something else intrigued me, too, the more I read the records of the debate itself: never did American politicians speak to the nation more honestly, more persuasively, more provocatively and more passionately, in language that was often so splendid it nearly reached the level of poetry. “The pool-tested, spin-doctored, shoddily argued and grammatically challenged ‘messaging’ that today passes for political communication is pathetic and often incoherent by comparison. “It can be no surprise that many Americans have lost interest in politicians who have forgotten how much can be accomplished by the persuasive power of well-crafted English. My own study led me to the conclusion that worthy debate, debate truly for the sake of heaven, must contain three essential elements: sincere intention, deep listening, and careful articulation. Like the disciples of Hillel and Shammai, we must have the greater good of the community in mind. We must strive to understand the opposing point of view, and we must be careful and masterful in our choice of words and civil in our tone. Does our discussion and debate in the Jewish community today, never mind in our society at large, pass this three-part test? And so, in the spirit of Abraham and Moses and the prophets and the sages, I urge us as a community, and my fellow citizens as a nation, to question without inhibition and to debate without intimidation. Let us seek out those opportunities, for they are the lifeblood of our Judaism and our democracy. Let’s debate more, not less, and let’s make sure that our argument is for the sake of heaven! As Barack Obama and Mitt Romney prepare for their final presidential debate this evening, we can certainly take Rabbi Schwartz's words to heart, and hope for a debate for the sake of heaven from our candidates. Sunday, November 4, 2012 8:30am-12 noon [Mitzvah Day]--We will be working through Bonim Builders to paint a classroom at Children's Aid and Family Services in Paramus. Meet at the temple at 8:00 AM and carpool or drive on your own. Just get into your “best “ work clothes and come on down! No painting equipment necessary. All will be provided. [ages 12 and up]. Clothing Drives--Winter clothes, including outer wear, for men and women Womens’ coats and jackets will be given to the Women's Rights Information Center, Englewood. 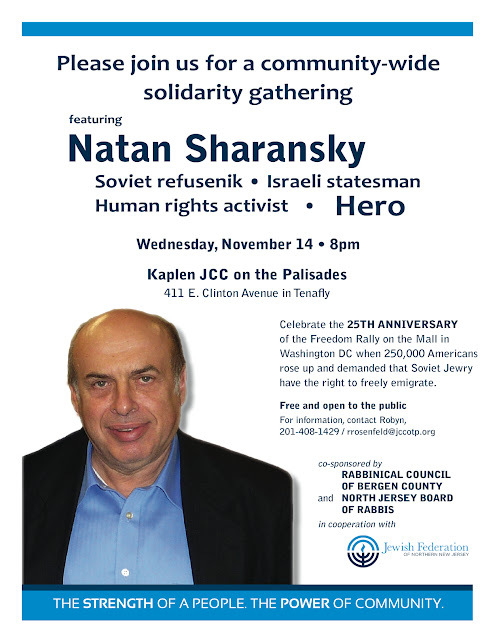 Also, womens’ and mens’ clothing and mens’ outer wear will be donated to the Hebrew Union College-Jewish Institute of Religion Soup Kitchen at the New York Campus. Please bring items to the temple, from October 21st through November 15th. The donated clothing will go directly to people in need. Stay tuned as there is more in the works! The story of the acquisition of the 1,564 Czech scrolls, which arrived at Kent House in February 1964, has passed into history as a small but remarkable episode in the tragedy of European Jewry. To those who were entrusted with the scrolls, they were a symbol of hope as well as sorrow, and also an intimate link with the individual historic congregations which were destroyed under the Nazis. Over the decades since the Scrolls arrived the racks have grown emptier as one Scroll after another has been restored to its rightful place in Jewish life. Now the only Scrolls that are available for distribution are those that are returned for a variety of reasons. 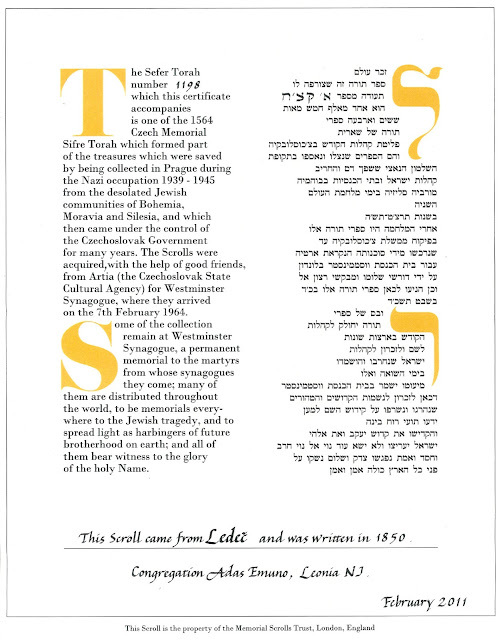 The Trust is now in the phase of ensuring that recipients remain aware of the unique importance of the Scroll in their care, and the special link it represents with the Jews of the destroyed congregations from which it came. This particular scroll was previously cared for by Congregation Beth Am of Teaneck, New Jersey, one of our sister shuls here in Bergen County. 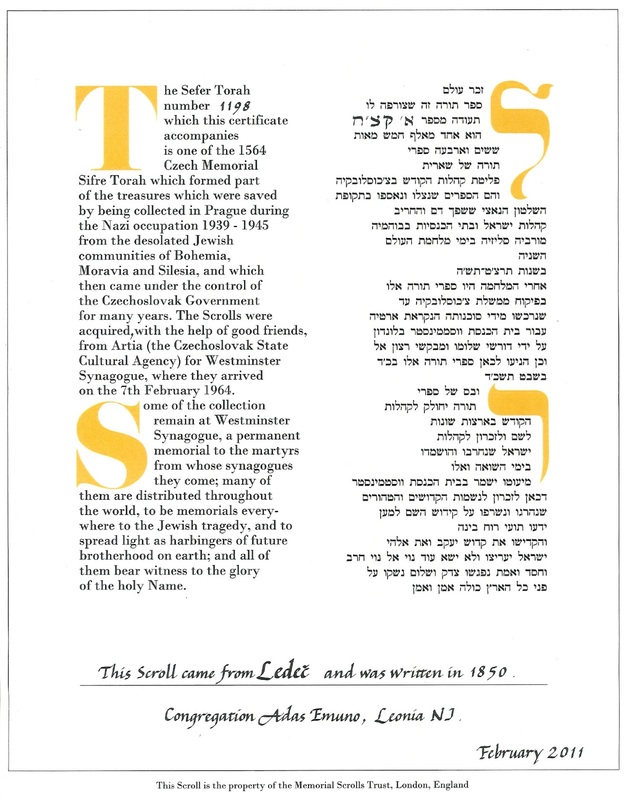 When Beth Am regrettably closed its doors last year, they generously passed this Holocaust scroll on to our congregation, along with many other gifts (not the least of which has been some wonderful new members), for which we are very grateful. It is indeed a privilege and an honor to serve as guardians of this Torah scroll, which Rabbi Schwartz now uses for the portion of our B'nai Mitzvah ceremonies where a Torah is passed down from one family member to the next, to symbolize the passing down of our tradition through the generations. And the survival of this scroll, and so many others like it, is very much a cause for celebration this Simchat Torah. Chag Sameach! celebrates the completion of the annual reading of the Torah. Simchat Torah is a joyous festival, in which we affirm our view of the Torah as a tree of life and demonstrate a living example of never-ending, lifelong study. Torah scrolls are taken from the ark and carried or danced around the synagogue seven times. During the Torah service, the concluding section of Deuteronomy is read, and immediately following, the opening section of Genesis, or B'reishit as it is called in Hebrew, is read. Does it put you in mind of our own Torah scrolls, and our little wooden shul in Leonia? Rotenberg's song begins with the writing of the Torah by a sofer, a Torah scribe, and to get a sense of how that's done, here is a video called Writing Sefer Torah Ashkenzai כתיבת ספר תורה that shows the writing of "one line from the Torah scroll, Balaq, Bamidbar. The speed is x2, to demostrate how much time it takes and to show the process of writing and making the taggin ( the 'crowns' on certain letters)." Our own celebration tonight will be limited to the sanctuary and temple grounds, but it will most certainly be just as joyous. Come join us for a Happy Torah and Chag Sameach! And also from our friends from Shalom Sesame, Kids Talk About Sukkot, featuring real children from Israel describing the symbols and traditions of the holiday using their own words (in English). And as the last two children relate, at the end of Sukkot comes Simchat Torah, a holiday we will be celebrating tomorrow evening at Congregation Adas Emuno, at 7 PM, which will include the consecration of our new Religious School students. We hope to see you there! Good morning, good yuntif, good to see you. sleeping, whispering, and some listening begins—yes, the appeal. about living, praying and giving—reigniting the flame within. So let's explore for a moment. If you will, take a deep breath in and let it out. Again. In this momentary pause let your head fill with thoughts about this place. Who did you come here with? Family? Friends? Alone? Why did you come here today? The people? The warm welcome you receive? The small, intimate space? We joined Adas Emuno in the mid 90s when our children were in elementary school. When did you join? What was your first encounter like? Who did you meet? We met lifelong friends because of Adas Emuno. We were not the go-to-temple-every-week kind of people and yet we were drawn in to this place. Confirmation. It is a whirlwind of activity and it is our future. congregation. Each one is awesome and special. temple is always there, if we choose to come or not. and action, for respite and for healing. For belonging and support. What is the catalyst that will make you say, this year I am going to give to Adas Emuno? This is just a reminder that the weeklong Festival of Sukkot is still going strong. If you missed the celebration this past Sunday evening, or even if you didn't, join us tomorrow night for Shabbat in the sanctuary and another visit to our congregational sukkah. According to the write-up, "no Etrogim were harmed in the filming of this video. (Lemons are a different story)"
Vocals: Yoav Hoze, Shani Lachmish, Ahava Katzin, Orri Dror, and Amit Ben Atar. Choreography by Tamar Erel. Music arrangement, performance, and mixing by Amit Ben Atar. Recorded at Bit Studios by Amit Ben Atar. Is it the stars in the sky? Or is it these dancing Jews? So, chag sameach, have a happy Sukkot for the remainder of the week, and join us tomorrow night for our Sukkot Shabbat! This eloquent quote from Hannah Arendt moves through a series of metaphors for historical consciousness. The first two, history is a hotel, and history is a vehicle, are rejected as misleading. Hotels and vehicles are both transitional spaces, areas inhabited on a temporary basis, not permanent dwellings. History is not a place we visit for a short period of time, or a place we merely use to get from point A to point B. Arendt further implies that history is not a commodity to be bought and sold, used and disposed of according to our mood. But this is less a statement of fact than an admonition, in response to the fact that it is indeed possible for individuals to reject and deny their past, to ignore and abandon their history. It is a commonplace to say that we cannot choose our parents, and the history of humanity that Arendt is concerned with is, after all, an extension of our personal and family histories. As an admonition, Arendt's remarks may seem to be a simple restatement of George Santayana's famous 1905 quote, "those who cannot remember the past are condemned to repeat it." And clearly, she shares in this sentiment about the importance of collective memory and the need to learn from the errors of previous eras. But she goes beyond this simple formulation by invoking the metaphor of history as a burden. History has gravity, history has weight, and the longer the historical memory, the heavier the baggage that accompanies it. Historical mass accumulates over time, and also through innovations in communications. In oral cultures, where writing is absent, history as we understand it does not exist; instead there is myth and legend, preserved through oral tradition by way of continued repetition via oral performance. Given the limitations of human memory, details about the past are forgotten within a generation or two, and the main function of myth and legend is to reflect and explain present circumstances. This collective amnesia allows for a great deal of cultural flexibility and social homeostasis, a freedom from the burden of history that literate cultures take up. The written word first makes possible chronological recordkeeping, and later historical narrative framed as an ongoing progression of events; this linear conception of time replaces the cyclical past of oral tradition, and what Mircea Eliade referred to as the myth of eternal return. And so we hear the complaint of school children in generation after generation, that history is so much harder now than it was for their parents, because now there is so much more of it than ever before. History is a burden, one that becomes too much to bear if all we are doing is living in the past, in rigid adherence to a fixed and unchanging tradition. But Arendt adds the complementary metaphor of history as a blessing. The burden can become a blessing if we use the past to understand the present, to serve the present, not to overwhelm or command the present. The past can inform the present, history helps us to see why things are the way they are, why we do the things we do; being mindful of the past is a means to help fulfill Arendt’s goal ofthinking what we are doing. But it is not enough simply to live in the present, and for the present. We also have to look towards the future, to work for progress in the moral, ethical, and social sense, to enlarge the scope of human freedom. And in light of this goal, Arendt invokes her fifth and final metaphor for history: history is a weapon. It is a weapon not to destroy or dominate others, or at least that is not what Arendt intends it to be, but rather a sword of liberty, an instrument to be used in the fight against oppression. This quote reflects Arendt's overriding concern with human freedom. The battle for freedom that she refers to is a collective struggle, not an individual quest. It can only be achieved by political cooperation and unity, not by solitary escape from tyranny. The commonly used phrase in western cultures, individual freedom, while not without value, all too easily eclipses the necessity of freedom as a shared responsibility, and in excess becomes oxymoronic. As the Rev. Martin Luther King, Jr., so eloquently put it, "injustice anywhere is a threat to justice everywhere" and "no one is free while others are oppressed." Freedom for all, shared freedom, requires a sense of affiliation, kinship, connection, which in turn requires a sense of continuity over time. Just as individual memory is intimately related to individual identity, our collective memory is the key to group identity. History is the foundation of community. Historical consciousness, which is derived from literacy, did not become widespread until after the diffusion of typography. In addition to making written history widely available, print media such as calendars and periodicals made individuals aware of their place in history as never before, down to the basic knowledge of the year, month, and date that we all take for granted, not to mention awareness of our date of birth and age. And as the great historian of printing, Elizabeth Eisenstein explains, more than any other factor, it was the printing revolution that gave rise to modernity. The irony is that as printing made the past more accessible, it also made it seem less valuable, resulting in modernity's ahistorical tendencies. Focus shifted from venerating tradition to revering progress, from looking back to origins to looking forward for originality. This is exemplified by the fact that printing gave us two new literary forms, the news, and the novel. And so we get Henry Ford saying, "history is bunk," and dystopian novels like Brave New World and 1984 portraying future societies where history is either deleted or subject to constant revision. Without a sense of the past, sensitivity to the future is undermined, and with the advent of instantaneous electronic communications beginning with telegraphy in the 19th century, more and more emphasis has been placed on the now, the present tense, leading us to lose touch with both the past and the future. Conceptions of the past have also been affected by the rise of image culture, beginning with photography in the 19th century, so that a coherent sense of linear history came to be replaced by a discontinuous, and therefore incoherent collection of snapshots evoking nostalgia, as Susan Sontag observed in On Photography. What Arendt makes clear is that contemporary present-minded ahistoricism risks more than Santayana's Sisyphean purgatory, but a true hell of oppression and slavery. So far, I have stressed a universal interpretation of this quote, and ignored its particular context. Arendt's admonition originates in a column she wrote for a Jewish newspaper, Aufbau, published in New York for German-speaking Jews, as part of a critique of the Reform movement in Judaism. The movement originated in 19th century Germany, as a response to the Enlightenment, and the Emancipation initiated by Napoleon, wherein Jews were released from ghetto confinement and given a measure of equal rights and citizenship. To accommodate their newly established status, the Reform movement sought to recast Judaism in the image of Protestantism, as just another religious sect. Apart from a liberalizing and modernizing of worship and religious requirements, this meant abandoning Jewish identity as a people, as a nation in exile, so as to give full political allegiance to the new nation-states of the west, and embrace a new national identity as citizens of Germany, or France, or England, or the United States. Consequently, the Reform movement rejected Zionism and made loyalty to the nation of one's birth a religious duty. Jewish identity and tradition were thereby reduced, compartmentalized as only a form of religious belief and practice, their political significance abandoned. As long as the Passover story does not teach the difference between freedom and slavery, as long as the Moses legend does not call to mind the eternal rebellion of the heart and mind against slavery, the "oldest document of human history" will remain dead and mute to no one more than the very people who once wrote it. And while all of Christian humanity has appropriated our history for itself, reclaiming our heroes as humanity's heroes, there is paradoxically a growing number of those who believe they must replace Moses and David with Washington or Napoleon. Ultimately, this attempt to forget our own past and to find youth again at the expense of strangers will fail—simply because Washington's and Napoleon's heroes were named Moses and David. Written in the dark times that followed Hitler's rise to power, the outbreak of the Second World War, and the establishment of Eichmann's concentration camps, Arendt's words are all the more poignant and powerful in their call for taking pride in the Jewish tradition of fighting for freedom and justice, and for an awareness that the cause of liberty and human rights have their roots in that most ancient of documents. Arendt's criticisms of the excesses of Reform Judaism were widely shared, and the movement itself changed dramatically in response to the Holocaust and the establishment of the State of Israel. Reform Judaism reversed its stance on Zionism, and remains a staunch supporter of the Jewish state, albeit with a willingness to engage in criticism of Israeli government policies and decisions. At the same time, Reform religious observance, while still distinct from that of the Orthodox and Conservative branches, has gradually restored many elements of traditional worship over the years. And the celebration of Jewish culture and identity has become normalized during the past half century. For example, witness Aly Raisman's gold medal-winning gymnastic routine at the recently completed London Olympics, performed to the tune of Hava Nagila; Keith Stern, the rabbi at the Reform synagogue that Aly attends, explained that " it indicates Aly’s Jewish life is so integrated into her entire soul, that I don’t think she was looking to make a statement as a Jew, I think it was so natural to her that it's more like, why wouldn’t she use the Hora? It shows again her confidence and tradition in a really fundamental way." Raisman's musical selection made an important statement as well, in light of the International Olympics Committee's decision not to have a moment of silence during the opening ceremonies to commemorate the 40th anniversary of the death of 11 Israeli athletes at the Munich Olympics in a terrorist attack. I think that Arendt would be nodding in approval at the way in which the teenage captain of the United States women's gymnastics team, in her own way, followed the example of Moses and David. Except by joining hands, marching together. The message of this prayer is that only by working together can we transform the burden of history into a blessing, only by working together can we wield the shared history of humanity in the service of human freedom and social justice. This is what Arendt wanted us to understand, to commit to memory, and to learn by heart.